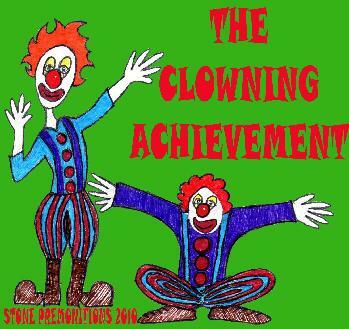 Stone Premonitions 2010 - "The Clowning Achievement"
This is essentially a Census of Hallucinations album, but due to some new contributors (namely Dave Hendry on keys/synth, who is responsible for the much-lauded project OHead), they've decided to revamp the name. The music hasn't changed much, though (there are even a few CoH remixes) and, like albums of the past, I would characterize this one as being more great pop songs balanced out with luscious deep-space ambient explorations, the latter of which bookend the best of said pop songs - the opening Perpetual Motion. The message of the lyrics is still staunchly of the Gaia, the Buddha, Positive and Cosmic Energy... which therefore necessarily addresses the many ills of modern society which fly in the face of these ancient truths; often angry, but inherently chock full of the Prems' patented whimsical effects and vocal absurdities. I dig the extended mix of Judas Kiss, those excellent dub-stuttered percussives, the classic guitar licks; this version adds some fresh organ and keyboard lines... many, many layers of sound going on. Down By the River is an unabashedly heartfelt tune which sounds autobiographical on Tim's part, as he sings of his appreciation of spending time in nature with his new son. Infinite Potentialities is a title that harkens back to the second CoH album, but this version goes further out at over thirteen minutes... the first half is a decent kind of Ozrix-sounding throb-jam, but things really take off into space-cruize heaven with a beautiful rhythmic melange of keys, effects, sequencers and guitar... transcendent. I liked where they were going with In the Image, it's a real freaked-out intro... after all it turns out to be another pop-tune... but it's a good one: very quirky of course, with Tim's angry rasp and a super-silly/fun chorus featuring Terri B. The same can be said for Why Are We Here? : starts off all loopy, then becomes a straight-forward song... gotta admit some of these tunes can drag a bit musically for me, but they're always redeemed as quality ditties by a solid chorus, cool quirks and interesting lyrics. The album concludes with Give Us Back Our Heaven, this version expanding on the quick but potent blast as manifested on the Fourth Dimension album... the spine of the song is a propulsive techno augmented by tablas and the profound desperation of the chorus... I like that they lengthened this tune, but they may have overshot the mark this time. All in all, if you like what this classy collective does, you won't be disappointed. PS: I feel it must be noted that most of the CD's released on this label are not of the highest quality or durability, so if ya can, lock this into your system asap!